We have recently had a number of situations where companies have not understood the obligations placed on them by the Human Medicines Regulations 2012 Regulation 44 (2) and (3) and Good Distribution Practice in relation to qualification of suppliers. In this post I want to remind companies of the requirements and give tips on ways to ensure your system of qualification is robust. One of the most important aspects of wholesale distribution is maintaining the integrity of the supply chain and preventing falsified medicines from getting to the public. There are 3 steps to go through to properly qualify your suppliers. The first step is to verify that supplies of medicinal products only come from persons who are themselves in possession of a wholesale distribution authorisation, or who are in possession of a manufacturing authorisation which covers the product in question. Traditionally copies of licences have been requested from suppliers, but this is no longer required as details of a licence of the supplier can be viewed via the MHRA’s register of wholesalers. Whilst the MHRA register is updated regularly it must not be relied on as a sole means of qualifying suppliers’ authority to supply. The information should also be verified by using the EudraGMDP website as this is updated daily. Currently the EudraGMDP website does not contain details of the legal categories of products that can be handled or 3rd party sites used and must not be relied on as a sole means of qualifying suppliers. When searching for companies use an asterisk (*) on either side of a name or number to broaden the search. You must also select UK as the country on the site details section. One practical way to demonstrate qualification of suppliers could be a printed copy of the appropriate pages, signed and dated as evidence the checks were made, when and by whom. Supplies from any other source, such as pharmacies, is not permitted. There remains a persistent misunderstanding that pharmacies can supply a small amount of medicines without a wholesale dealers licence. This is not the case as the exemption that allow this trade was removed in 2013. For supplies obtained from wholesalers and manufacturers based in other EEA member states, the same checks should be made on EudraGMDP and via licences that have been translated and authenticated by a notary. Some Member States also have their own registers and these can also be referenced to support qualification. The second step requires that wholesalers verify that any wholesale supplier complies with the principles and guidelines of good distribution practices. 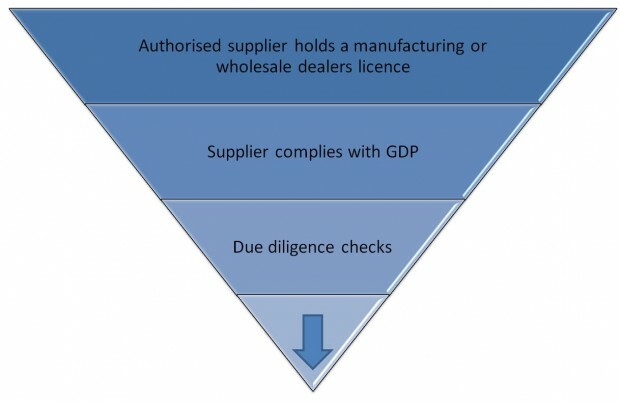 To establish GDP compliance, the GDP certificate of the wholesaler should be viewed on the EudraGMDP website. Certificates when issued are valid for 5 years. The date of the certificate expiry should be recorded. The MHRA adds conditioning statements to GDP certificates for new applicants and those companies where the inspection outcome indicated a more frequent inspection schedule is required, limiting certificate expiry to 2 years. If there is no GDP certificate available then other evidence of GDP compliance by the wholesale supplier should be obtained, such as a copy of their last inspection close out letter confirming GDP compliance. The third step is periodic rechecking of the information obtained and due diligence. Wholesalers must be aware of issues that could affect their suppliers’ continued authority to supply. There should be a procedure that ensures there are documented checks made at least twice a month of MHRA’s list of suspended licence holders and regular checks on EudraGMDP website for issued GMP and GDP statements of non-compliance. There should be at least an annual full re validation of the information held on suppliers. Supporting all of the checks made so far is effective due diligence by the Responsible Person. In a recent case a quantity of a high value medicine was stolen and re-introduced in to the supply chain. The medicine was sold in an unusually large quantity and purchased by several wholesalers. After the event, looking at the evidence available to the purchasers, it was apparent that the company selling the stock had a conditioned GDP certificate, a poor financial history and no previous access to such large volumes of high value stock. checking the financial status of the supplier, how long have they been trading, and do they have an acceptable credit history. Has an audit been performed of the supplier, or has anyone in your company visited them? If so what was their impression? Where is the stock coming from and is the product offered a new product for your company? Is the product being offered available in quantities or volumes that are unusually high or is the price being offered lower than the usual price? How transparent is the supply chain of this transaction? What will be the method of transportation? Due diligence checks should be implemented and documented when dealing with a company or transaction that is outside of an established trading pattern. As a final thought on due diligence, please be aware that criminals actively look for weak spots in the supply chain so they can make money. We have had reports that companies with wholesale dealer licences are being ‘cloned.’ Here a company uses the licence and address details of a legitimate company but sets up a fake website and bank account that is similar to the real operation. Typically this fake company will offer some tempting stock and send information using genuine company details but from a different email account possibly substituting .com for .co.uk or from a closely related website name. The bank account information will be for the fake company. Please take extreme care if your supplier advises the bank details have changed and your accounts team should be made aware of this practice. For companies that are involved in the sourcing of medicines from a third country for export to third countries then there are different requirements. Companies are obliged to document that checks are made to show that where the medicinal product is directly received from a third country (“A”) for export to a third country (“B”), the supplier of the medicinal product in country A is a person who is authorised or entitled to supply such medicinal products in accordance with the legal and administrative provisions in country A. Any licences obtained should have been translated into English and authenticated by a notary with appropriate due diligence carried out. In my next post I will write about qualification of customers.